This week pasted rather quickly with some snow days included but the good news is I got some extra shop time to finish my cleaning and have already started pulling things apart again. Was able to almost complete an order of wine tilts for a customer but still waiting for the garage to get above 40 so I can spray lacquer them. Hopefully tomorrow. May have to spur it a bit with a heater. 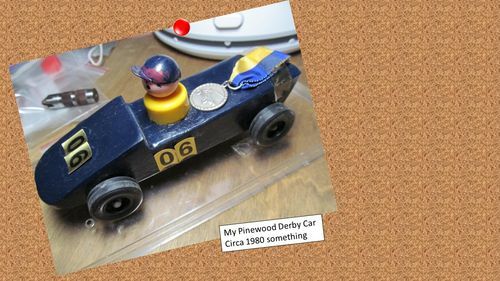 I am sure some of you are aware it is Pine Wood Derby Season again, I had a friend call and ask if her son could come over so I can help him cut out his car. They came over one of the snow days and I had the bandsaw set up and ready to go. He had a vague idea of what he wanted and I showed him out to cut it out on the saw then refine with my rasp and sandpaper. He left with a good design he needed to go and decorate. Do any of you open up your shop to help neighbors and friends with their cars? In this day of parents doing so much I think it is important for the boys to work on their own cars. I was actually able to dig mine out of a box…. No laughing… this would be very close to being one of my first woodworking projects. We owned very few tools at the time and my father was not the most handy person. I can’t recall but I am guessing my grandfather helped me cut the shape with a coping saw. It wasn’t pretty but it got a silver medal at least and back then you only got a medal if you won the race nothing else. I started today on the last piece of my office furniture. I more book shelf that will hold my grandfathers toolbox on the top. This one is going to be interesting as I decided to build it out of some reclaimed pieces from my basement bedroom in my parent’s house which my grandfather helped me to build more than 20 years ago. They recently demoed it due to water problems in the basement. I will have some pics soon. Lastly this week I decided to make some new items to put on display at Carnival of Collectables a market that we are currently selling at in New Jersey. I wanted to something a little different than my usual…. 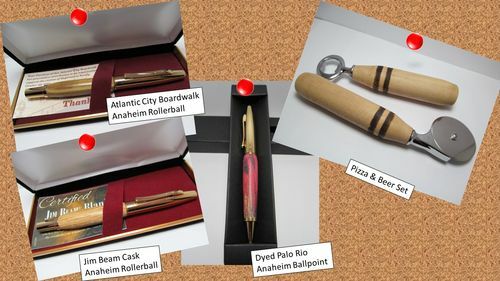 A pen made from a reclaimed board of the Atlantic City Boardwalk, One from Jim Beam Barrel, a double dyed Palo Rio blank and the first Pizza & Beer set. Looking forward to getting all of these things in place. If you are in the South Jersey area and looking for a place to sell check them out as they are still taking vendors. Next week I will have some pics from the display and go over some of the display and our plans for PortablePastimes this year. Thanks All, Have a good week in and out of the shop.